Her Renegade Series includes A Beautiful Glittering Lie, A Beckoning Hellfire and A Rebel Among Us. All three novels are award winners, and tell the story of a family from north Alabama who experience immeasurable pain when their lives are dramatically changed by the war. Ms. Hawkins has recently released a nonfiction book about the War Between the States, titled Horses in Gray: Famous Confederate Warhorses. She is currently working on another sequel to her series. Ms. Hawkins is a member of the United Daughters of the Confederacy, the International Women’s Writing Guild, Rocky Mountain Fiction Writers, and Pikes Peak Writers. She is also an artist and singer/songwriter. A Rebel Among Us by J.D.R. Hawkins is a Civil War novel with a powerful setting, great and compelling characters, and a plot that leaves readers no chance to put down the story, even for a moment. After the bloody battle of Gettysburg, the Confederates are badly beaten. Hit by a Union picket, David Summers is carried away on a horse to a Pennsylvania farmhouse where he is received and treated by a teenage girl, Anna Brady, and her three sisters. To his great dismay, David learns that his comrades have deserted, but what is more painful is what is happening to him — he is falling in love very fast with Anna. Anna has an unusual proposition for him and he finds himself in a dilemma: should he return to the army or follow through with her plan? J.D.R. Hawkins has written a story that is as intriguing as it is gripping and there is just no way for the reader not to fall for the well-developed and interesting characters. The setting is wonderful, the Civil War period with many historical references. The plot is well-imagined and expertly executed and the reader feels as though the action is taking place before their eyes. The reader is hooked from the very beginning of the story. When Maggie calls her sister with urgency, telling her someone is in the barn, the reader becomes very curious to know who it is, what he wants, and… yes, there are many questions. The writing is stellar, laced with beautiful, vivid, and compelling descriptions. I love writers who don’t waste words and Hawkins happens to be one of those. She handles the conflict expertly and the different themes, including love, war, and humanity, are beautifully woven into the fabric of the tale. 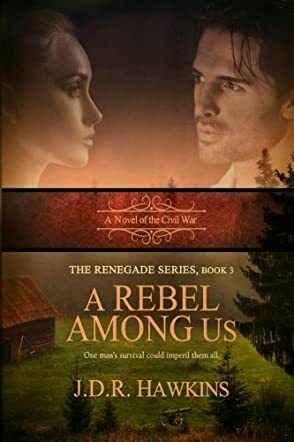 There is a lot that readers will love about this novel, from the gripping plot to the masterful writing, from the conflict to the satisfying finish; they will find A Rebel Among Us to be highly entertaining. One of the best books I have read this year.